MARCO ASENSIO STRUCK a last-gasp winner as Real Madrid edged to a 1-0 win at Leganes in the first leg of their Copa del Rey quarter-final. Zinedine Zidane’s men, 19 points behind Barcelona in LaLiga, had won one of their last five games in all competitions, amid reports the Frenchman could leave the club at the end of the season, and they looked set to be held at Butarque. 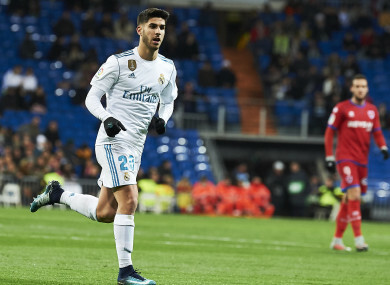 But after Leganes had shone on their first appearance at this stage of the competition, Asensio came up with a cute near-post finish from Theo Hernandez’s cross to put Madrid in firm control of the tie. Madrid were held at home by lower-tier clubs Numancia and Fuenlabrada in previous rounds after first-leg away wins and they failed to respond to Saturday’s 1-0 defeat at the hands of Villarreal, with Mateo Kovacic missing a golden first-half chance. Jose Naranjo and Claudio Beauvue forced smart stops from Kiko Casilla and Marcos Llorente headed against his own crossbar, adding to the sense of injustice at Leganes’ defeat. Madrid were poor for large parts of the contest, but Asensio’s dramatic impact may serve to ease the growing pressure on Zidane ahead of Wednesday’s return leg at the Santiago Bernabeu. Email “They left it very late but Real sneak Copa win to ease the pressure on under-fire Zidane”. Feedback on “They left it very late but Real sneak Copa win to ease the pressure on under-fire Zidane”.